Kneel onto the padded platform of the assisted pull-up machine and grasp the close parallel bars. Allow your body to descend until your arms are fully extended and your shoulders are stretched upward. Exhale as you pull your body upward until your elbows are by the sides of your body. Inhale as you lower your body in a controlled manner until your arms are fully extended and your shoulders are stretched upward. Assisted pull-up machines come in two major forms: one in which you kneel onto a padded platform, as above, and another in which you stand on a metal lever. 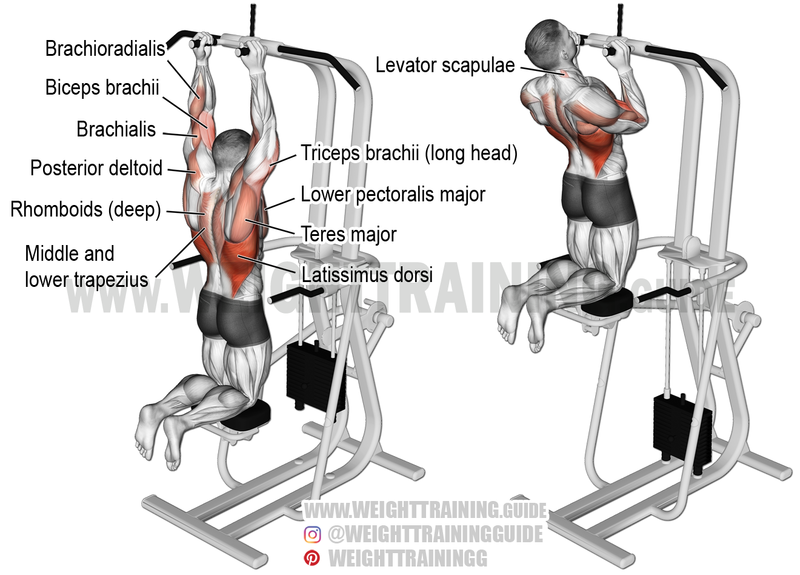 The machine-assisted close neutral-grip pull-up is great for strengthening the muscles necessary to be able to perform the proper close neutral-grip pull-up. Keep decreasing the amount of assistance offered by the machine until you can perform pull-ups without any assistance. If you do not have access to an assisted pull-up machine, flex your knees and get a training partner to hold your feet. You can also kneel onto a resistance band, each end of which you strap to one of the parallel bars. Never do pulldowns. Only do pullups, even if it’s assisted ones.